New, yet familiar, legislation passes one hurdle at the state capitol. The so-called revolving door bill (AB 245) from Madison Democrat Spencer Black makes its way through the Assembly Judiciary and Ethics Committee. "This bill would close the revolving door currently between the legislation and special interests. It would prohibit legislators from becoming lobbyists for 12 months after they leave office." Current law already restricts most former state officials from becoming high-paying lobbyists within one year. However, Black says legislators are exempt. "You can&apos;t escape the fact that some legislators may be thinking when they&apos;re in the legislature of how they prepare themselves for a lucrative career as a lobbyist. I think it&apos;s time to not allow that. You know, special interests have too much influence already." Black says lawmakers are involved in drafting legislation, casting votes, and making million-dollar decisions effecting special interests. "A legislator shouldn&apos;t be able to vote for a special interest one day and then collect a big salary as a lobbyist the next day." Black says that type of activity creates the impression of corruption at the Capitol. Many other states have laws in place prohibiting such behavior. If this bill seems familiar to you, that&apos;s because Representative Black or his colleagues have introduced similar measures in the last eight legislative sessions, without ever getting to the governor&apos;s desk. Black is optimistic that the environment in the current legislature makes passage of such legislation more likely this time around. 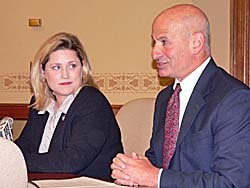 Companion Senate legislation is sponsored by Senator Julie Lassa.